This another sad story related to the always struggling Mexican Grey Wolf. It was shot and killed by Feds because it was found “consorting” with domestic dogs. This same wolf had previously mated with another domestic dog and that dog had 5 pups. All but one of the pups were euthanized. This is what happens when a struggling population isn’t allowed to have the correct amount of breeding partners due to the slow release schedule that the government enforces. SILVER CITY, N.M. – At the direction of the U.S. Fish and Wildlife Service, an endangered Mexican gray wolf was shot dead on private land within the Gila National Forest of New Mexico Wednesday. The lone 4-year-old female wolf was reportedly attracted to a residence to consort with domestic dogs and was shot as a purported threat to human safety. Earlier this year the same wolf had mated with a dog elsewhere and given birth to five hybrid pups, four of which were captured and euthanized; the fifth has not been found. “This very sad episode is a result of the Fish and Wildlife Service’s refusal to release enough wolves into the wild to allow this single female to find a mate of her own kind,” said Michael Robinson of the Center for Biological Diversity. 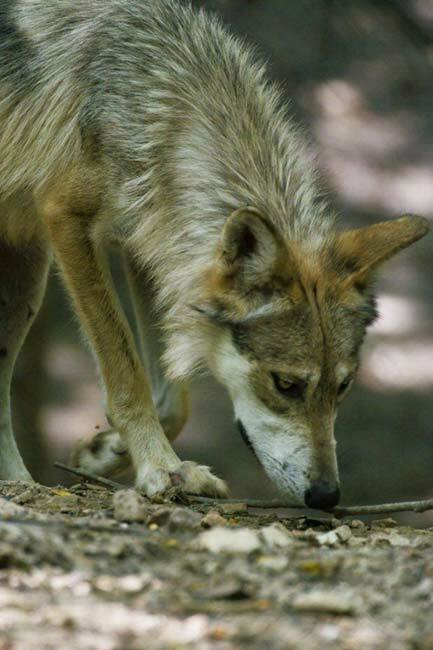 The 1996 environmental impact statement on reintroducing Mexican wolves to the wild addressed potential hybridization and promised to minimize it in part through “reestablishing wolf populations in numbers sufficient that potential wolf mates are available for dispersing wolves.” But this has not occurred. The document projected that by the end of 2006, 102 wolves, including 18 breeding pairs, would live in the wild, with the numbers expected to continue to rise after that; a 2001 scientific review concluded that the recovery area spanning the Arizona and New Mexico border had sufficient deer and elk to be able to support 468 wolves. Yet the highest number of wolves counted was 59 in 2006; at the end of 2010, only 50 wolves, including just two breeding pairs, could be found in the wild. Despite this shortfall, over the past five years of the reintroduction program, which began in 1998, the federal agency responsible for helping endangered species has only released a single wolf from the captive-breeding pool into the wild (in November 2008) along with 11 wolves who had been captured from the wild in previous years. Dozens of other wolves were captured and have been indefinitely locked up (and 11 other wolves were shot by the government for livestock depredations, though none in the past four years). Today, 12 once-wild wolves are biologically suitable and legally eligible for release into New Mexico. This entry was posted in Education, News and tagged conservation, Mexican grey wolf, wolf, wolves. Bookmark the permalink. The arrogance and cruelty of mankind never ceases to amaze me or to make my blood boil. And what exactly is wrong with Wolf-Dogs, the result of a mating between the wolf and the domestic dog I wonder…then again they are also a sadly misunderstood breed too. Thanks for posting this…heartbreaking but vitally important and also educational.